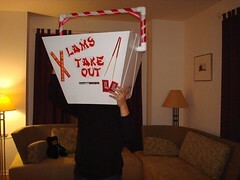 Jed Lam send me this photo of his Halloween costume, which was inspired by The Fortune Cookie Chronicles. Originally he wanted to go as a fortune cookie but that proved too difficult to make. But he happened to have a takeout box in the fridge. And using that as a model, he just cut up some poster board to match the shape. He explained that other than getting the side folds just right, the hardest part was the lettering. Turns out there’s actually a font called “takeout” (who knew? I knew there were ones called chop suey). He slapped that on along with a requisite red dragon on the back (actually wanted a red pagoda but couldn’t find one) and voila! The handle is just PVC piping and it actually works.